"Five carnival workers are kidnapped and held hostage in an abandoned, Hell-like compound where they are forced to participate in a violent game, the goal of which is to survive twelve hours against a gang of sadistic clowns." Yet another adaptation of "The Most Dangerous Game", but this time populated with the usual American white trash characters and psycho clowns which are the norm for Rob Zombie's movies. Maybe he has something against Juggalos, or maybe he likes them? I really don't know. What's far more evident is how there isn't a whole lot of anything very original about "31". 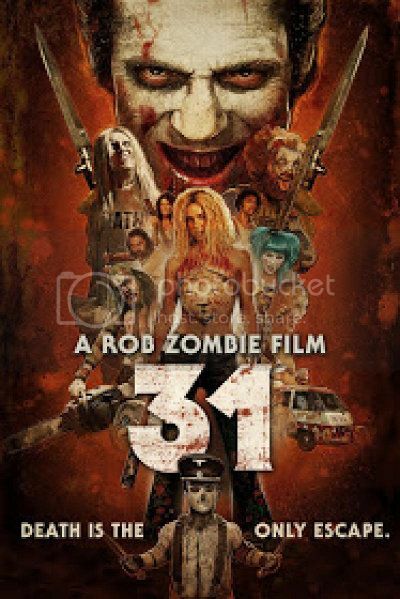 In other words, "31" is Rob Zombie's version of "Hostel" and "The Running Man" with his very beautiful wife Sheri Moon Zombie as the star, and Malcolm McDowell picking up a pay cheque for doing not very much except play dress-up and chew scenery in the background. Jeff Daniel Phillips as Roscoe Pepper and Richard Brake as Doom-Head steal every scene they are in, but Richard Brake is the most memorable as a cross between Rorschach from "Watchmen" and a much better version of The Joker than in any of the "Batman" movies. The rest of the cast play mostly disposable characters who exist only to be killed off before you even have time to care about them. Everyone runs around stabbing, bashing, slicing, and wielding various weapons against each other in a very satisfying manner if only this movie had been made 10 years ago. The kills aren't very inventive, but they are competently executed. Pardon the mostly intentional pun. Malcolm McDowell punctuates all the expected blood, gore, and violence like something out of Derek Jarman's "Jubilee" (1978), but there's not really enough of him to stand out like he often does. Shame. Fan favourites Meg Foster and E.G. Daily make up for this to some extent by adding more pathos to their performances and characters than the rest of the movie actually deserves. Minor spoiler: Sheri Moon Zombie has lovely wrists, but the open ending is annoying. Nicely shot, "31" isn't a bad movie, and it's certainly much better at storytelling than "The Lords of Salem" (2012), but Rob Zombie's best work still begins and ends with "The Devil's Rejects" (2005).